I love the crunch of the delicious oat clusters. The dried raspberries also add that special pop of flavour to the cereal. A great addition to breakfast. 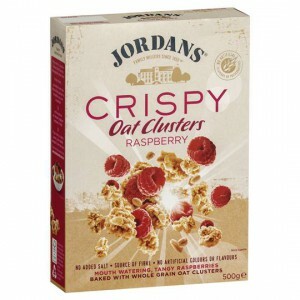 Jordans crispy oat clusters are delicious and our family all really love this raspberry flavour. The kids actually love to eat it dry or with milk as an after school snack and it keeps them going until tea time. I personally like to add it on top of my greek yoghrt as a little bit of a sweet and crunchy hit. Jordans Raspberry Crispy Oat Clusters is a treasure of nature, the goodness of nutritions , I tried it when I Been in my friends house it was amazing ???? goodness in a box. these are delicious and the raspberries are full of flavour. perfect to eat as a snack but also great to have with milk or yogurt for a yummy breakfast. I literally just had this for breakfast this morning, and my kids were clambering to get the raspberries… so I guess you could say that there are too few of them. I really love the taste of this cereal, the crispy and the soft. But it';s WAY WAY too expensive for what it is. I’m not a cereal eater – at all! But a friend gave me a no of this in a hamper recently so I gave it a whirl. Yummm is what it is. It stays crunchy in the milk, and the burst if raspberry flavour makes it even better. There could be more raspberries perhaps though. How would you rate Jordans Raspberry Crispy Oat Clusters?